Mark Webber | Aussie Grit: My Formula One Journey – now available in the UK! Aussie Grit: My Formula One Journey – now available in the UK! In his trademark straight-talking, no-nonsense style Mark reveals his amazing life on and off the Formula One race track. From his first taste of karting to his F1 debut in 2002, scoring Minardi’s first points in three years at the Australian Grand Prix, through to his first win with Red Bull at the 2009 German Grand Prix and the year he should have been crowned World Champion. Mark Webber’s journey to the top of Formula One was every bit as determined and committed as his racing. This is his searingly honest story. Aussie Grit: My Formula One Journey (the UK title), is out on September 10 in hardcover and e-book in the UK. Published by Pan Macmillan, Mark’s eagerly anticipated and already internationally best-selling autobiography will be widely available from all good book stores and online retailers and is available to pre-order now. What if I don’t live in the UK? Aussie Grit has already been published in Australia (July 1) and is still available to purchase there, however if you’re outside of Australasia or the UK, you can purchase the UK version in hardcover or Kindle format via Amazon and have it shipped or delivered to wherever you are. What are the differences between the UK and Australian versions? They are minimal. The front covers and the forewords are different – the UK foreword is by three times F1 World Champion Sir Jackie Stewart and the Australian foreword is by cricketing legend Steve Waugh. Also the title differs slightly – in the UK it is ‘Aussie Grit: My Formula One Journey’ in Australia it’s simply ‘Aussie Grit’. Will you be selling any signed copies of the UK version via the markwebber.com shop like you did with the Australian version? We certainly will. There will be a very limited number of signed books available via the markwebber.com shop – full details will be available via the shop soon. Are there any opportunities for me to meet Mark in the UK and get my book signed in person? The public signing dates are before Aussie Grit is published in the UK, how will I get a copy in time? The stores that are doing the signings will stock early copies of Aussie Grit specifically for you to purchase on the day to have them signed by Mark. I have the Aussie version already but think I might just have to get the UK version as well just because… I need no further reason than that. Its Mr Webber, thats reason enuf for me! Absolutely gutted. I am a teacher and will be back at school on the book signing days and I would have travelled to wherever!! Any chance of a Saturday or late night signing? Hi Kirstan – that’s a real shame. Unfortunately it’s the publisher who controls the book signing schedules (Pan Macmillan UK in this case), so they are the best people to direct any queries too about the schedule. Please reserve a signed copy for me…obviously let me know how much it is plus postage etc. I can’t make any of the shop / signing sessions….Trafford Centre on Mon 7th is the nearest to me but that is over 100 miles away, so easier for me to order one via your shop. Many Thanks. Hi Philip – sorry to hear you won’t be able to make any of the signings. Unfortunately as we have such a small number of signed books we aren’t able to take any pre-orders for them I’m afraid. That said, if you subscribe to receive news, we will send a notification email out when they are available so hopefully you’ll have a good chance of getting a copy that way. Signed Book now ordered…many thanks for letting me know. Looking forward to receiving it. Is there any way to preorder a signed copy? I’m in the U.S. and am afraid I’ll miss out on the announcement like I did for the Australian signed edition due to my work schedule. I’m not usually able to do non-work emails during the day. My husband told me last week that a signed copy is the one thing he really wants for Christmas. He’s taken care of me this last year and I want to do something nice for him. I’d appreciate any insight or consideration. Hi Christa – I’m afraid as we have such a limited number of books we can’t accept pre-orders for the signed copies, we have to do it on a first-come, first-served basis. If you are unsuccessful please email the shop and they may be able to offer alternative information on getting signed copies. Will these signed copies be available for shipping like worldwide, or just in the UK? Hi Melissa – full details on purchasing the limited number of signed copies will be available soon, but yes, they will be available to customers in the UK and worldwide. I would like to order 1 of Marks books from the UK,, do i need to wait and order on the 10 Sept 2015. Hi Geoff – if you’d like to pre-order a copy of the UK version you can do so now via Amazon.com or Amazon.co.uk and have it shipped your destination. There will also be an opportunity to purchase one of the limited number of signed copies available from the website shop. We will announce via the website (and send an email notification out) when they are available. Is it possible to pre-order a UK signed edition of Aussie Grit? Hi Alexander – unfortunately we can’t take pre-orders for the signed editions we will have for sale on the shop. You can however pre-order unsigned copies via Amazon, WHSmith, Waterstones and other UK bookstores. I have read the Oz version. Now need a signed UK copy via air mail. Pleeese. I hope I can find it here in Uruguay, South America. Itd be so nice to have it! Hi Teresta – you should be able to buy a copy from Amazon and have it delivered to wherever you are. Fingers crossed! 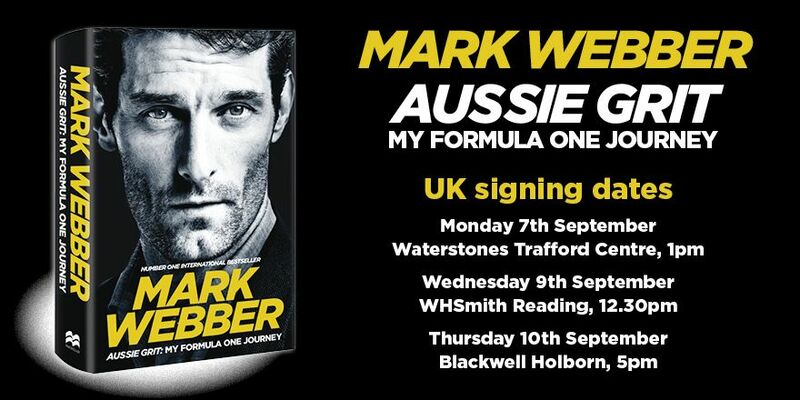 Hi, my Dad is a MASSIVE Mark Webber fan but I can’t get to any of the book signing events because I live in Somersert and just missed out on a copy from Waterstones Trafford. It’s my dad’s 50th on 20th September and I am therefore desperate for a signed copy. Is there any way this can happen, please? It would make his day, and you only turn 50 once as they say? Hi there Petar – We have spoken to the publisher and they have said that they allow up to two books per person, so that should be fine. But the book stores will allow you to reserve books ahead of the signing (as they only have a limited number of advanced copies from the publisher) so it may be a good idea for you to do this if you don’t want to miss out on the day. will the book be available also in Italian language? Hi Sandro – at this stage I’m afraid there are no plans to release the book in other languages. If that changes we’ll certainly make an announcement on the website.